Fall might be just around the corner, but summer is still sizzling at Shake Shack, where they are adding the limited time offer Bacon CheddarShack Fries ($4.69) to the menus at both Arizona locations. Beginning today, enjoy Shake Shack’s signature crinkle-cut fries topped with smoked Niman Ranch bacon and Wisconsin aged cheddar cheese sauce. Even tastier, pair your Bacon CheddarShack Fries with another limited time special, the Bacon CheddarShack Burger featuring an all-natural Angus beef hamburger topped with smoked Niman Ranch bacon and Wisconsin aged cheddar cheese sauce. And don’t forget to save room for Shake Shack’s famed frozen custard concretes, shakes, cups & cones, such as the only-in-Arizona ‘Mallow Monsoon concrete. Brimming with chocolate and vanilla custard, marshmallow sauce, chocolate truffle cookie dough and crumbled sugar cone cookie, it’s the perfect way to cool down and savor monsoon season here in the Valley. Shake Shack is a modern day “roadside” burger stand known for its 100% all-natural, antibiotic-free Angus beef burgers, chicken (no hormones added ever), flat-top dogs, frozen custard, crinkle cut fries, beer and wine (available at select locations) and more. With its fresh, simple, high-quality food at a great value, Shake Shack is a fun and lively community gathering place with widespread appeal. From its premium ingredients and caring hiring practices to its inspiring designs and deep community investment, Shake Shack’s mission is to Stand For Something Good. 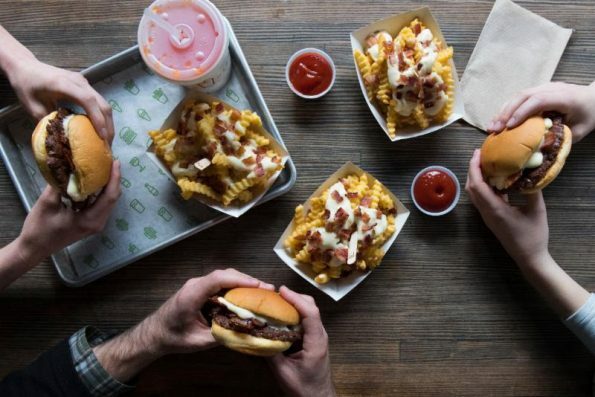 Since the original Shack opened in 2004 in NYC’s Madison Square Park, the company has opened multiple locations in 14 states and the District of Columbia, as well as international locations including London, Istanbul, Dubai, Tokyo, Moscow and more.